Does your hotel, resort or spa need a social boost? Do you want to increase your fan base and get existing leads engaging and interacting with your brand online? An online contest allows you to expand the reach of your hotel or spa to new audiences while building your relationship with existing clients or guests. This article will show you step by step how to run an online hospitality contest. I’ll give you new ideas of how your business can thrive with an online contest through real-life examples and ideas you can try yourself. Why even run a contest in the first place? An online contest allows you to garner a larger fan following, interact with your existing fan base and gives you the chance to collect lead information for the future. And lets face it, with photo contests, essay contests, video contests, referral contests, etc - the possibilities for your online contest are endless. As a hotel, resort or spa, running a contest that gives you user-generated content allows you to hit two birds with one stone. You can expand the reach of your brand and get new leads while also gaining information and content that you can use in future marketing campaigns. Photo Contest: A photo contest gets your participants to submit a photo relating to a specific theme. It gives your business the opportunity to gain information from entrants as well as images which you can use down the line to promote your hotel or spa. It’s a great way to get current and potential customers engaging directly with your brand and your industry. Instagram Hashtag Contest: A hashtag contest allows your fans to simply upload photos to their own Instagram account while using your signature hashtag in order to be entered to win. All photos with that hashtag will then be displayed in a voting gallery on your Facebook page, website and so on. Everyone on vacation likes to show off on Instagram anyway, so this type of contest requires little effort for participants and gives you user-generated content relating to your resort, hotel or spa. Essay Contest: An essay contest requires entrants to submit a text-entry about a certain topic. You get to decide the type of question you want to ask them such as why they deserve to win a vacation at your resort, hotel or spa. Essay contests give you a look at your leads’ current wants and needs and allows them to communicate about a topic relating to your brand. The more leads think about your brand and how great it would be to win your contest, the more inclined they are to visit your location in the near future. With certain contest providers like Wishpond you can also get others to vote on their favorite submission. Video Contest: A video contest is one of the most engaging contest types but also requires a lot of effort from entrants. One creative idea is to ask participants for a vacation video diary from their time at your hotel, resort or spa. With smartphones in hand at all times it isn’t too hard to capture your favorite vacation moments on film. Of course you could also run a vote contest, photo caption contest or sweepstakes, but the user-generated style of contests we have listed above are our recommendations for the hospitality industry. The great thing about running a contest in the hospitality industry is that your business has great prizes to give away that participants really, really want. From a one or two-night stay at your hotel, a deluxe spa package, or a mutually-beneficial deal with a car dealership, adventure company or ski package - the possibilities are endless. Showing off your resort or hotel visually in your contest will make all participants want to visit, even if they don’t end up with the grand prize. Good visuals encourage people to participate in future contests and book a trip down the line. Of course these prizes can vary dramatically in value, so ensure that your prize is proportionate to the level of effort participants need to exert. For example if you’re running a video contest the prize should be of higher value than one for a simpler hashtag contest. If you’re looking for prize inspiration, check out our article 101 Best Prize Ideas to Give Away in Online Contests & Competitions. Once you decide the theme of your contest, you need to ensure your headline is attention-grabbing and can be used across your various contest promotional channels. So what makes a good contest headline? 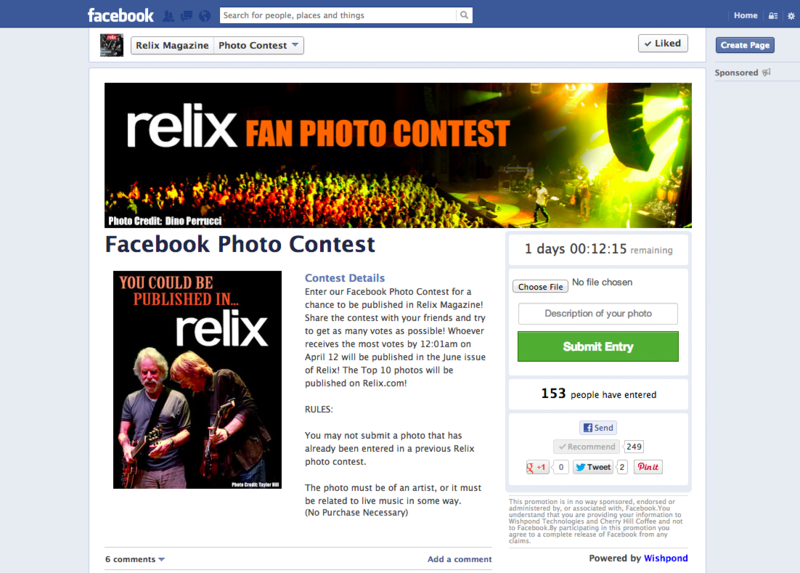 Besides your image, the headline is the first thing entrants will see on your contest page or banner. It needs to entice them to enter with just enough info to want to learn more but without giving away everything. And yes, it does need to be perfect. Imagine reading a headline of a contest for your brand and right away spotting a grammatical error (or worse a spelling mistake). Chances are you’re not going to have the most positive feeling about the legitimacy of the contest. Most importantly you want your headline to instantly grab the attention of people scrolling through Facebook or surfing the web. One way to do so is to also include the value of the prize in the headline. When it comes to hospitality, looks really do matter. Think about the last vacation or spa appointment you made. The first thing you likely did was click through the photo gallery tab or scroll through the pictures displaying their products and services. You want to evoke a feeling of relaxation, fun, or enjoyment when it comes to your resort, hotel or spa. This contest uses an image of 2 girls surfing in order to evoke a desire for fun and adventure from participants. They also smartly partnered with another business (Let’s Go Surfing), a great contest idea for any resort, hotel, or spa. My only recommendation would be making the image a bit larger and cutting down the brown banner a small amount to show more of the beach and surfing. 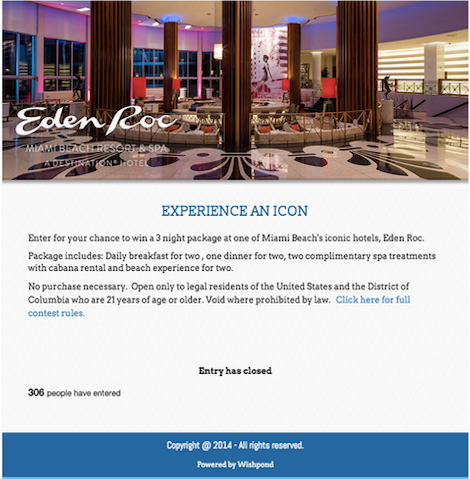 Eden Roc chose to use a gallery for their contest banner image which is a fantastic idea. They had four different images that revolved, allowing participants to get a good glimpse of various aspects of the resort from the beach to the pool to the bar. This makes entrants more likely to enter and more intrigued as to what else the resort has to offer. 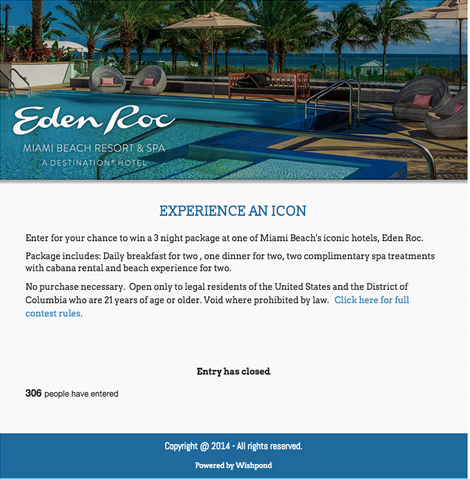 How can you inform past or potential hotel, resort or spa guests about your amazing contest? So what does the ideal hospitality contest look like? This example, from “Beach with Benefits,” is one of our favorites. 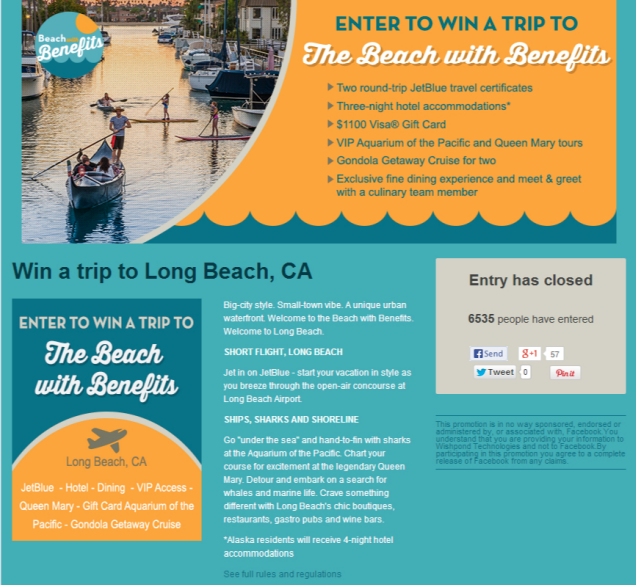 It has a catchy headline “Enter to win a trip to the beach with benefits” enticing participants to learn more while also using a fun but consistent color scheme throughout the page. It displays an image relevant to the contest (they win a free Gondola ride) while also clearly displaying all of the different elements of the prize. Obviously this contest has a very high prize value, and as a result the brand was able to gain lead information from more than 6,300 people. This doesn’t mean your prize needs to be this big by any means. But, a good design a relevant prize and image and a strong headline will lead you down the path to success. As a hotel, resort or spa, sometimes running a contest can seem overwhelming. But it doesn’t need to be. With the right contest type, prize, headline, image and promotional strategy you can motivate participants to enter and be rewarded with hundreds or even thousands of new leads. 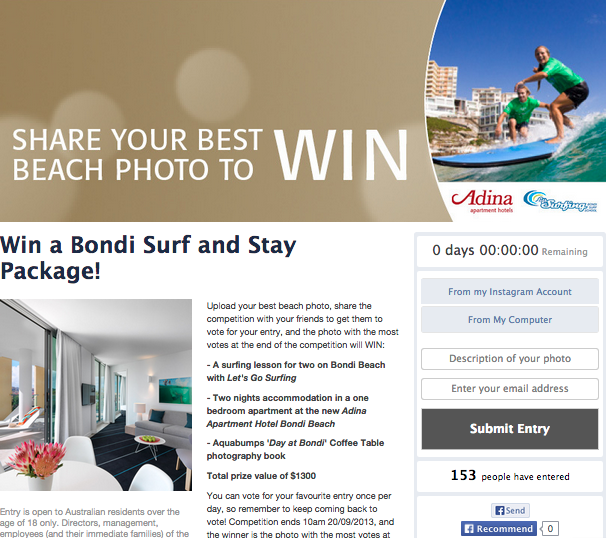 Are you a hotel, resort or spa that has run an online contest? What was your experience like? Feel free to shoot me a line in the comments section below!